Andrew Crawford is an associate in Brown Rudnick’s Government Contracts group and counsels clients on federal and state bid protests, debriefings, claim preparation, contract administration issues, and wage and hour disputes. He also counsels clients on various economic sanctions programs, with particular attention to OFAC’s Russian and Venezuelan sanctions. Andrew serves as a Board Member of the Brown Rudnick Charitable Foundation and as a member of Brown Rudnick’s Associate Liaison Committee. While in law school, Andrew was a legal intern for The Honorable David A. Lowy at the Essex County Superior Court. He also served as a Note Editor on the Journal of Law & Social Justice and was awarded a Top-Ten Brief at the Wendell F. Grimes Moot Court Competition. 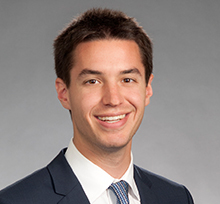 Prior to attending law school, Andrew worked at Pfizer’s Government Relations office in Washington, DC. Additionally, Andrew has served as an intern for US Senator Richard Burr (NC), the US Senate Committee on Indian Affairs, and the US Senate Committee on Energy and Natural Resources. Engineering Support Personnel, Inc. (GAO, B-412697, 2016): Representation of ESP in protest of award under Army’s Fort Rucker support services contract. In response to the protest, the Army took corrective action. BCF Solutions, Inc. (GAO, B-413287, 2016): Successfully protested $42 million Department of the Navy, Naval Sea Systems Command contract award for the development of crew-served M2HB/M2A1 Weapon Sights. Discover Technologies LLC (GAO, B-412773, 2016): Successfully defended against protest of award of a $28.75 million Department of the Health and Human Services, Food and Drug Administration contract for website content management system support services. Sotera Defense Solutions, Inc. (GAO, B-414056, 2017): Successfully defended against protest of an award of a $157 million Department of the Army contract for software and engineering support at 73 locations around the world. Aided in successful defense of protest at the Court of Federal Claims of a $20.5 million Department of the Navy contract for port operations services. Pennsylvania Remediation Company LLC (GAO, B-414675.2, 2017): Representation of PaRC in protest of award under Department of the Army, Corps of Engineers contract. In response to the protest, the Army took corrective action. Recognized as a “Rising Star” in Washington, DC by Super Lawyers (2017, 2018).